The following table makes extensive use of the Netscape table format and as such may not be viewable by some browsers. For those without such a browser, please follow this link. 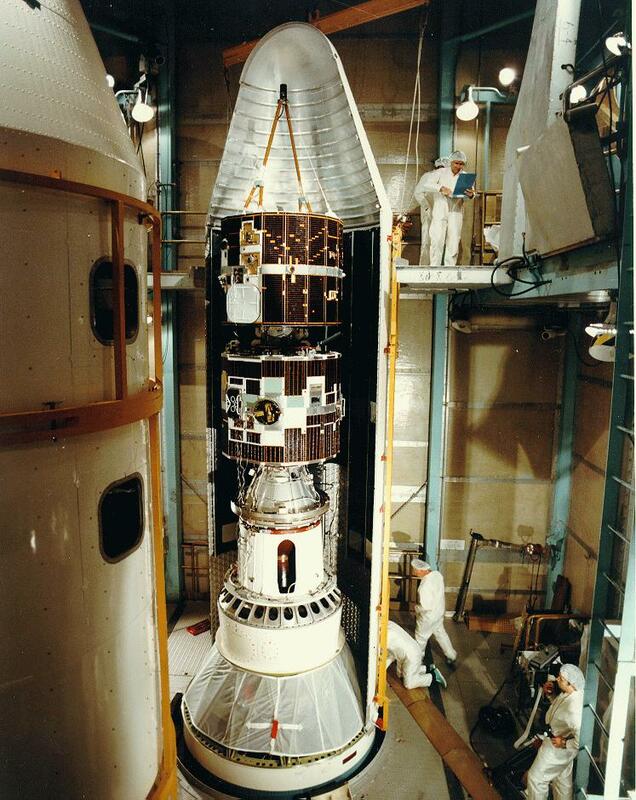 (600x747) A pre-launch photo of the DE-1/DE-2 spacecraft stack before being covered by their fairings and mated with the Delta launch vehicle. DE-1 is on the bottom. 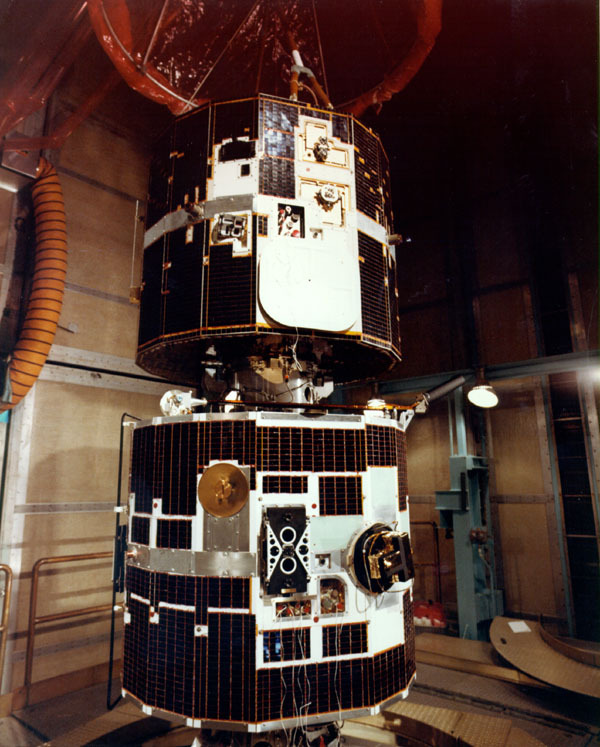 One of the three SAI instruments is visible in the center of DE-1 with the several different sized circular openings. (747x940) A pre-launch photo of the DE-1/DE-2 spacecraft stack as they are being covered by their fairings and mated with the Delta launch vehicle. DE-1 is on the bottom. 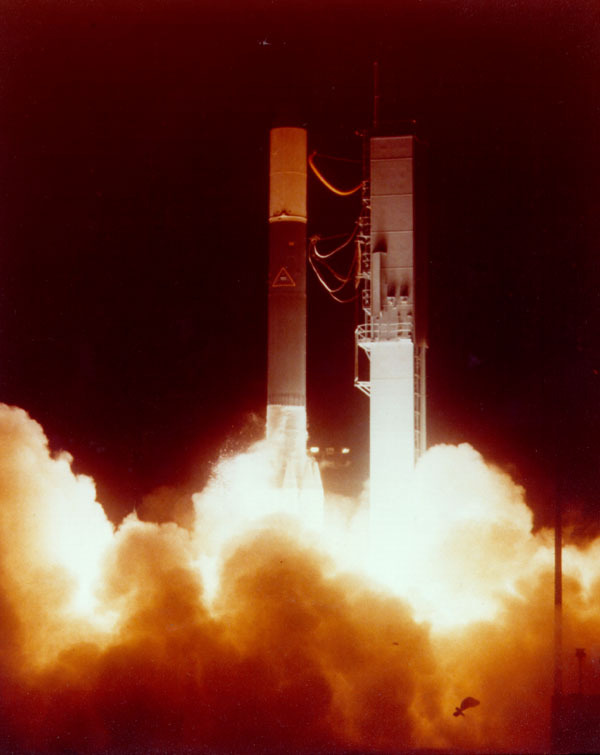 (600x755) A launch photo of the Delta launch vehicle with the DE-1/DE-2 spacecraft aboard. 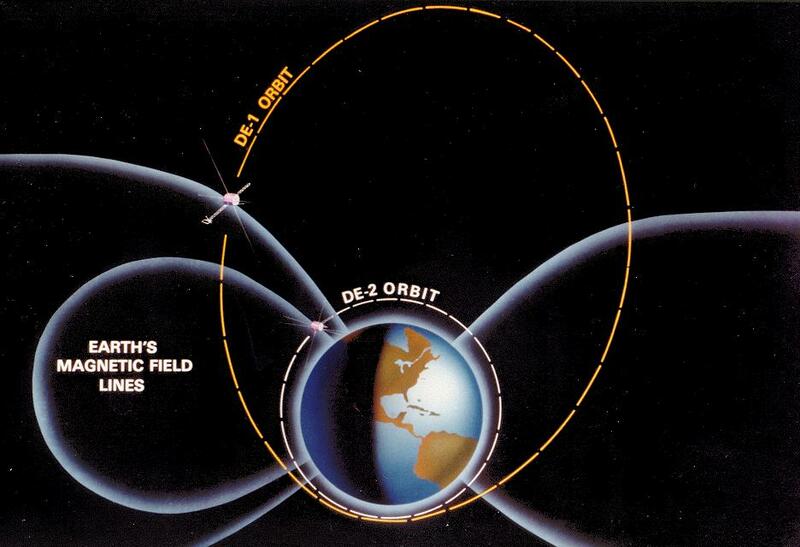 (410x414) An artist's painting of the two Dynamics Explorer satellites in orbit over Earth. 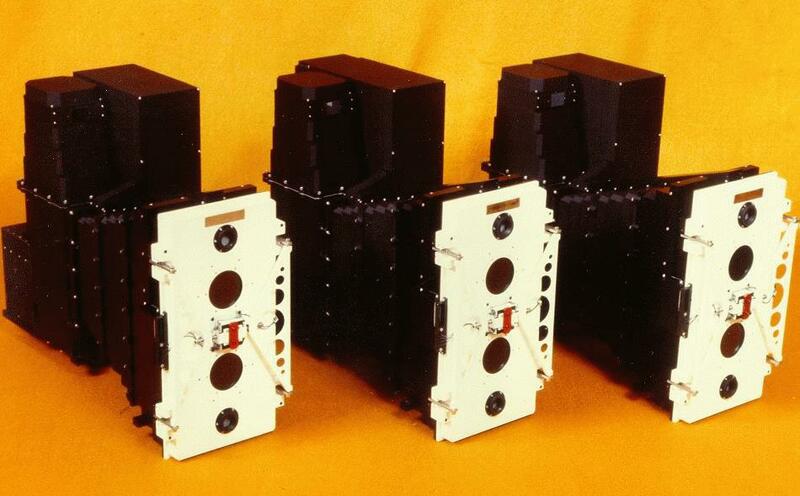 (950x589) A pre-launch view of the three SAI photometers prior to spacecraft integration. 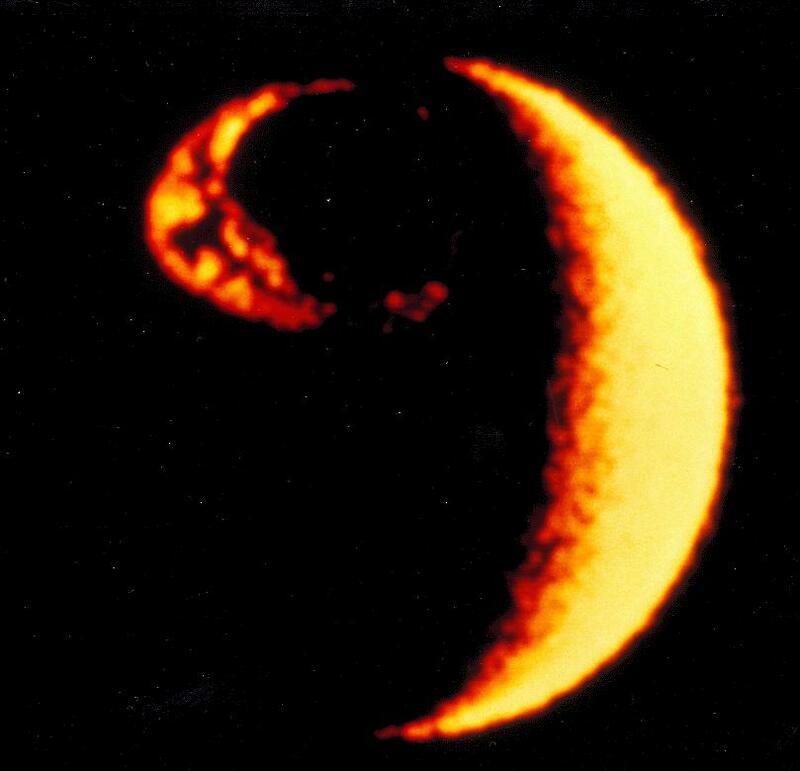 (1024x768) An example of a very large auroral oval time sequence over the southern polar regions that occurred 13 Mar 89 (89/072). The upper panel of images run from 1649 to 1813 UT, at 12 minute intervals. The large image on the right is the 1737 UT image. 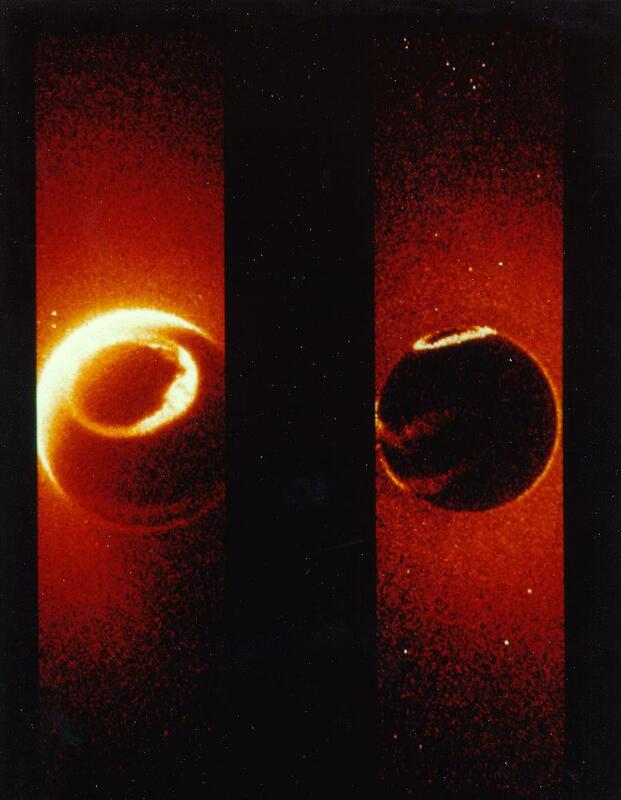 The large image on the left is an example of a quiet auroral oval for comparison from an earlier time period with the same viewing geometry. 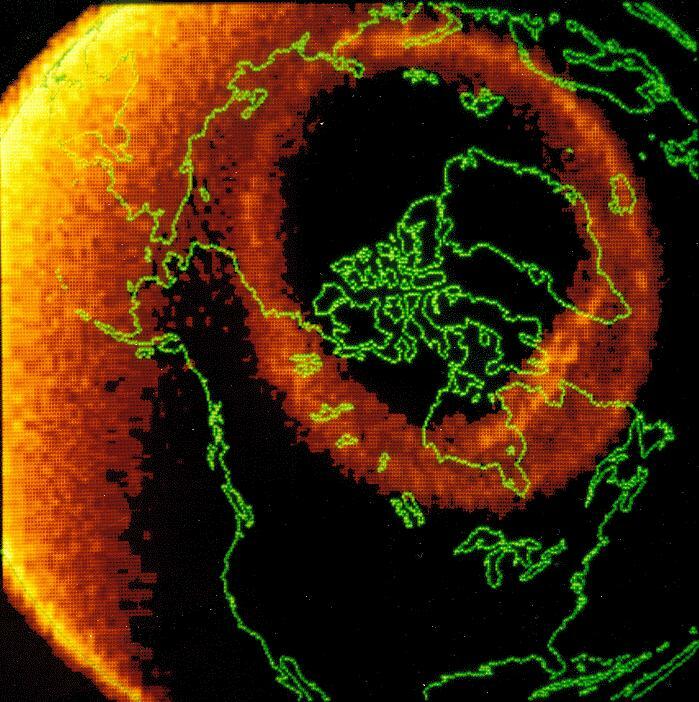 (1024x768) The left image is an extreamly large aurora that occurred 14 March 1989 at 0151 UT over the southern polar regions and the right image is a re-mapping of that image along magnetic field lines to the northern polar regions. 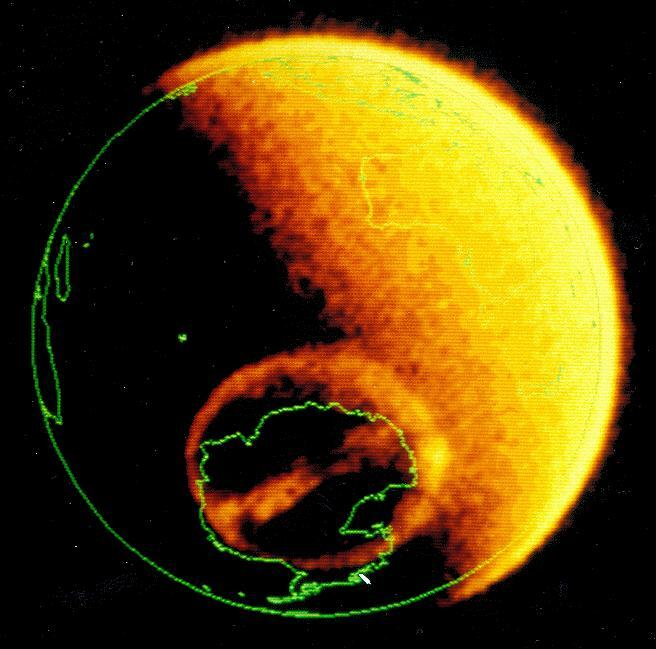 This is a close approximation of what the auroral oval probably looked like if DE-1 had been over the northern hemisphere at this time. (1024x768) A long, breath-taking sequence of images showing the growth and decay of a Theta Arc feature first seen with the DESAI. This image sequence occured 8 November 1981 (81/312) from 14:12 UT in the first image in the upper left panel until 17:02 UT in the lower right panel. Each image is separated by approximately 12 minutes. (249x716) Low altitude image with the bioluminance filter (482M) showing some city lights visible in Central America and the southern portions of North America along the Baja California region on 27 Sep 81 (81/270) at 4:50 UT. 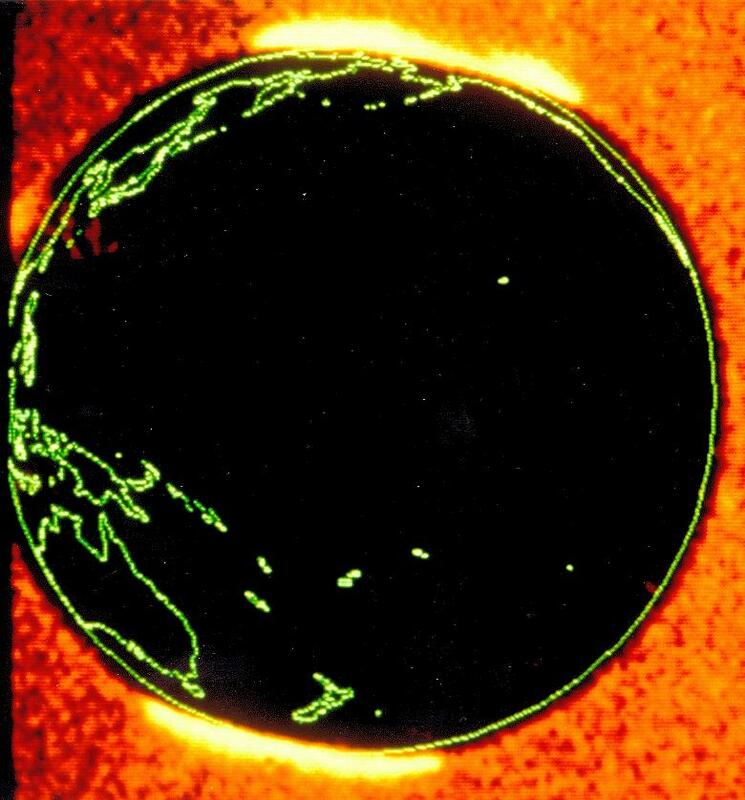 (1024x768) A bright auroral oval as seen from directly over the north pole. This image was obtained 23 Nov 81 (81/327) at 10:48 UT. (635x746) Same as above, except this image includes a coastline map overlayed on the SAI image. It also has the Magnetic and Geographic North poles marked as M and N, respectively. (1024x768) A full 360° image (in 3 panels) showing the VUV photometer's field of view of the sky. The galactic plane is clearly visible crossing the right-hand panel. The image was obtained 21 Jan 86 (86/021) at 19:40 UT. This document has been accessed a total of 72,964 times.